Take a pan and boil water. Blanch spinach leaves for 3-4 minutes. Take it out, drain and put it in the cold water. 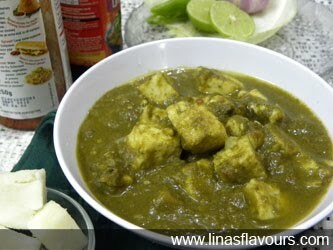 Make a puree of spinach and green chillies. Take a pan and heat oil. Add onions, ginger paste and sauté it for 2-3 minutes till the onions turns translucent. Add tomato, salt and sauté it for 2-3 more minutes. Add spinach puree and cook it till it boils. Add paneer pieces, fresh cream, lemon juice and cook it on a low flame for 2-3 more minutes.